WEYMOUTH, Mass. — A disabled veteran’s family will move into a foreclosed home on Lake Street, and another disabled vet will get an apartment in the backyard, thanks to a nonprofit housing group that bought the property and plans to renovate it. The good fortune for the as-yet-undetermined veterans will be built on the misfortune of another veteran, 76-year-old Joseph Zona, who lost the property last winter when he couldn’t make the payments on the mortgage plus loans he had taken out to do remodeling that he never finished. But Zona, who has moved into senior housing at the old Fulton School in Weymouth, said he’s glad to be rid of the house he’d owned for more than a dozen years. His son, Richard, said he’s happy about the outcome, too. 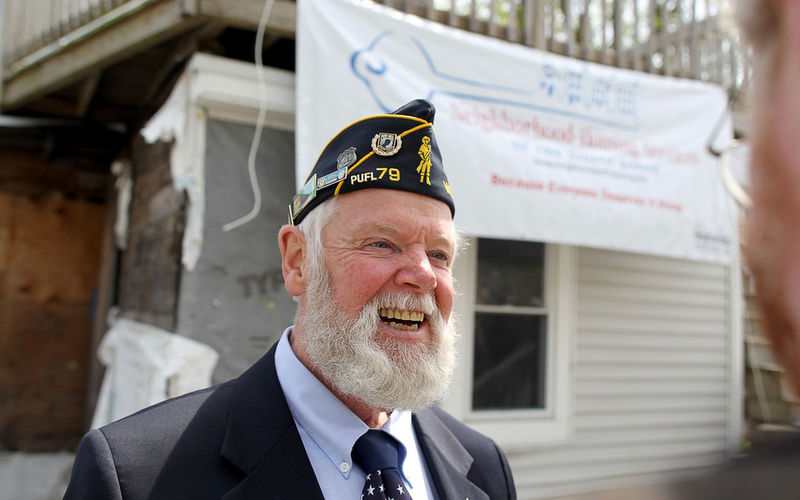 “That’s good that vets are moving in; it makes me feel a little better that it’s going to some good use,’’ said Rich ard Zona, who lived in the backyard apartment at 63 Lake St. for several years. Neighborhood Housing Services of the South Shore, a nonprofit group with offices in Quincy and Brockton, bought the Lake Street property recently for about $170,000, and plans to spend about another $120,000 on renovations, according to its executive director, Robert Corley. The town will contribute about $200,000 toward the cost, using federal grant money, said Weymouth’s planning director, James Clarke. “They came to us and we thought it made a lot of sense, and we’re really happy we can accommodate our returning vets,’’ Clarke said. The two-family house on the property will be turned into a single-family home with three bedrooms, and the first floor will be made accessible for someone in a wheelchair, Corley said. The backyard cottage also will be renovated and made handicapped accessible. Both units will be rented by lottery to veterans with disabilities, with preference given to Weymouth residents, he said. Neighborhood Housing Services has bought several foreclosed homes to rent to veterans in Quincy and Brockton, but this is a first for Weymouth, and for disabled vets with families, Corley said.